For this product test Steve Williams of Liss Electrical tries out some VDE insulated screwdrivers from Milwaukee. Although the brand has been popular across the pond for a very long time, I’ve been aware of Milwaukee tools for a couple of years now, having seen its range power tools emerge in the UK market. 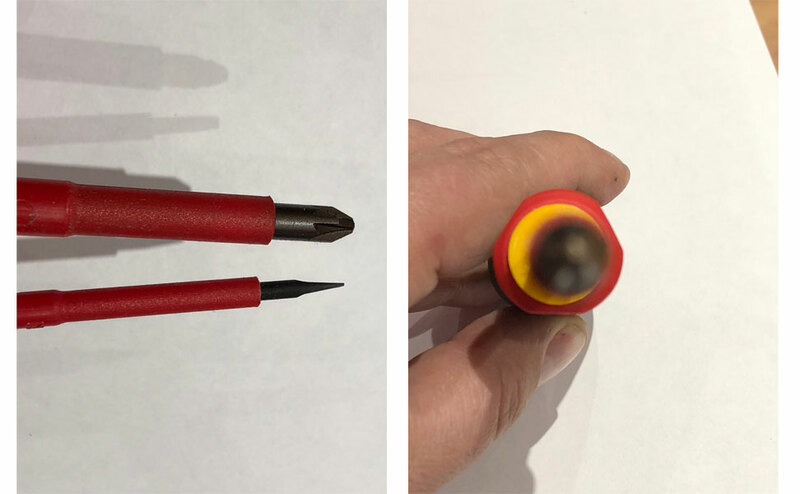 Aside from its extensive range of power tools and storage options, the company has also ventured into the hand tools sector, as evidenced by the two different packs of VDE insulated screwdrivers that I was given to trial. The seven driver pack contains three flat head screwdrivers – a PH2 and PZ1&2 – while the five driver pack consists of a flat head and 2 PZ (1&2). PH and PZ drivers are a standard size that we can all relate to, but where manufacturers often differ from one another is on the flat head dimensions. This dictates the depth and grip on the screw slot, and how much torque that can be applied on the material in question. Too narrow a blade and the tip of the driver can twist out of shape or end up drilling a hole in the screw slot. Too wide and the blade can gouge the material around the screw, or not fit in the hole at all. As a workaday electrician, I’m in and out of domestic and commercial installations, each with their own styles of fixings and access holes. There is no one-size-fits-all screwdriver, which is a shame, having said that though, I’d still need to carry two as I have a habit of losing screwdrivers. The widths of the Milwaukee drivers are 2.5, 3 and 4mm. The blades are a deep wedge shape, which allows them in to narrow slots. 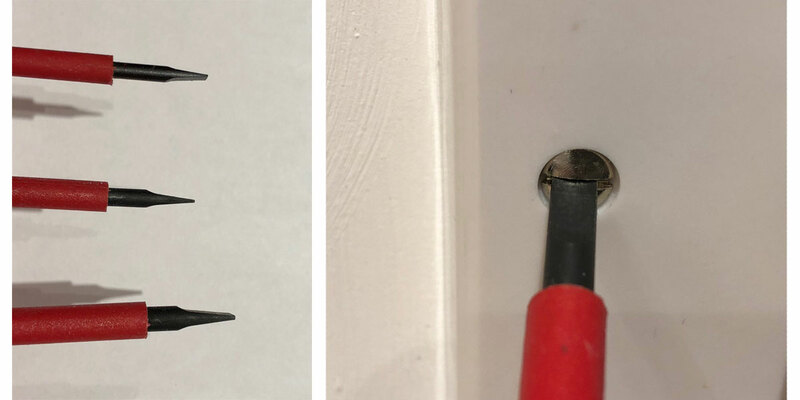 The 1,000V rated insulation ends way back from the tips and the thickness of the insulation steps down near the tip to allow access in to narrower holes. The handles are of a ‘lobed’ shape, to help prevent them rolling away and the grip is a comfortable, rubberised egg shape that beds in to the palm. Other nice features include a visual wear indicator to issue a replacement warning to the user, lanyard holes to ensure you’re not dropping and damaging the tools and a robust EVA foam fitted zipper carrying case.